Obama Calls On International Community To Fight Ebola : The Two-Way The president warned that the U.S. alone could not halt the epidemic and that without more help to stop the disease, hundreds of thousands of people could die. President Obama speaks about the Ebola epidemic Thursday at United Nations headquarters in New York. 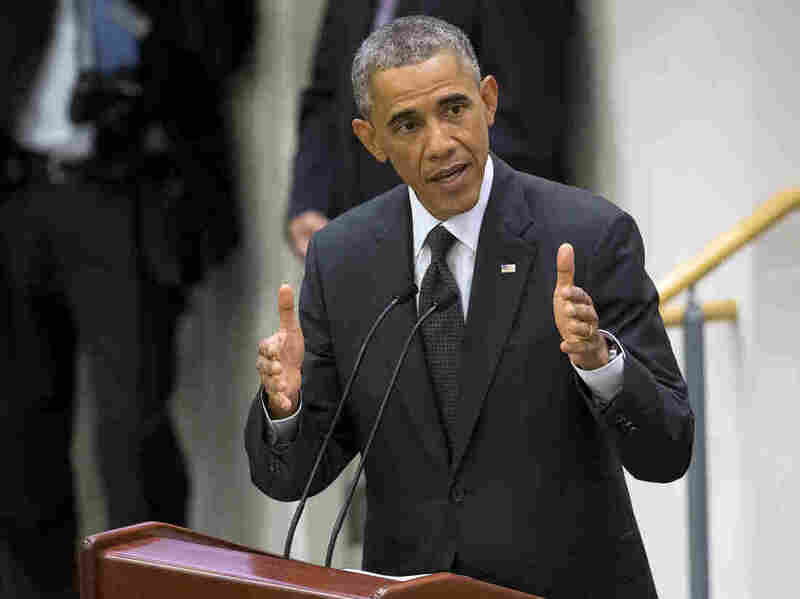 President Obama urged the international community to join the United States in trying to stop the Ebola epidemic in West Africa, saying the disease could kill hundreds of thousands of people in the coming months if it is left unchecked. "If this epidemic is not stopped, this disease could cause a humanitarian catastrophe across the region," Obama said at a U.N. meeting in New York. "In an era when regional crises can quickly become global threats, stopping Ebola is in the interests of the entire world." The president spoke on the same day that grim new stats on the progress of the deadly virus were released. In Sierra Leone, one-third of the country's 6 million people are under quarantine. The World Health Organization says more than 2,900 people have died from Ebola and that the outbreak continues its rapid growth. Earlier this month, the U.S. announced a major push to help set up facilities in Africa to control the outbreak. Even so, Obama said right now "patients are being left to die in the streets because there's nowhere to put them and no one to help them." He referred to a health worker in hard-hit Sierra Leone who compared fighting the epidemic to "fighting a forest fire with spray bottles." Sierra Leone's President Ernest Bai Koroma told the gathering that the world has been slow to respond. Meanwhile, the president of Liberia, Ellen Johnson Sirleaf, who addressed the meeting via video, said her country's economy is being strained by the crisis. WHO chief Margaret Chan said the virus is still jumping over everything that's put in place to slow it down. "Right now everybody has the best intentions, but people are not putting in the resources that are necessary," Obama said. "It's a marathon but you have to run it like a sprint. "Stopping Ebola is a priority for the United States. We will continue to lead and do our part. But this must also be a priority for the world," the president said.